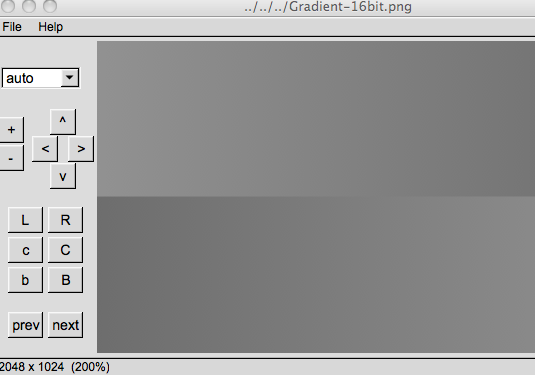 The main purpose of this software is to display graphics files, supported are the most common image formats. Special attention has been laid on deep color formats with more than 8 bits per color component. These include png, logluv and other tiff variants, bmp, fits, and the special jpeg variant with 12 bits color resolution. For jpeg files a postprocessor is applied to reduce some typical compression artefacts. Another unique feature is the support for z-surface formats, especially surface definition format (sdf) and srtm satellite height data (hgt). With the help of the fltk library this software is very portable to most common computer platforms and also staying compact in size. A Toolbar is placed on the left side, optimizing available space for today's wide display formats. Note: all downloads below are portable version without installation. test patterns - High Resolution Test Patterns for Testing Imaging Systems. gamma - Test images for gamma error in picture scaling.